There are so many pressures on schools to perform well. Whilst there is the ongoing emphasis on exam results for league tables and Ofsted, every school knows that teenage years are about much more than exam performance. It’s at this time that young people are forming their identity, their interests, and talents, and most importantly developing that all-important sense of who they are as a person. Developing their confidence and resilience to handle the ups and downs of life is central to this. 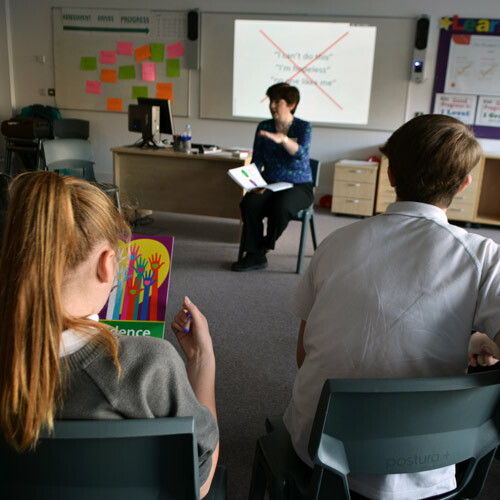 Through the Building Resilience Programme we help students to improve their self-awareness, and to develop a more positive attitude to themselves. One session focuses on ‘Goals and aspirations’ and girls are encouraged to consider their future career and set clear goals for themselves for the short and long term. A coaching approach is taken throughout the sessions, so that the students themselves develop their strategies for handling different pressures. These new skills and attitudes enable students to be engaged at school, which helps them to progress in their self-development and academically. Schools may choose to fund some students through Pupil Premium. The Building Resilience Programme is an effective, focused way to invest in these students, to help close the gap for their achievement at school. It is possible to provide feedback on the difference seen in the attitude and approach of Pupil Premium students, over the course of the programme, to demonstrate the impact of the Pupil Premium investment. At Confident Teens we understand that measuring the effectiveness of our programmes is key. Every girls completes a feedback form at the end of each workshop, and feedback is also requested from teachers and parents. Both qualitative and quantitative results are summarised into a clear report for discussion with the school. An external facilitator can bring a different perspective to students, challenging their assumptions and helping them to develop fresh thinking and set themselves clear goals. Or use our contact form to send us your email address and we’ll be in touch with further details and to discuss the needs of your students and school.